Your website is the most important asset to your business. It’s a digital home base for customers and clients to purchase your products and services, and stay up to date as your brand grows. That’s why it’s important to put thought and effort into creating a website that converts. We start the process with a deep-dive discovery to fully understand the scope of your website needs and organize all the elements of your business into a customer journey that’s guaranteed to convert to sales. 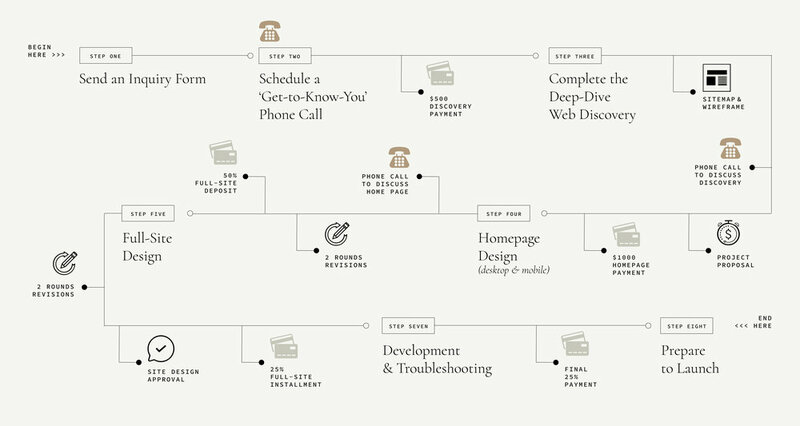 We charge a $500 fee for this process, which includes a sitemap and wireframe. Our intention with this process is to give you a roadmap for a solid website that you can either build yourself, hire a different agency, or choose to continue the full build with us. A sitemap is the page organization of your website - a PDF that outlines the page-by-page content needed to create a site that meets the needs of your business. Because most of us are visual, we also include a wireframe presentation that gives a rough outline of how that information will be organized on each page in a visual way, using placeholder images and text. This will give you a checklist to create and organize the content needed to build your full site, and is included in the discovery cost. Once we’ve completed the initial discovery, we’ll have enough information to create an estimate for the full design and build of your website. The proposal will include the cost, timeline, and technical details to help you make the best decision on this important business investment. We’ll begin the process by designing the home page. A home page is a great opportunity to establish repeating styles, create the navigation and footer, and make some important design decisions that will carry out to the rest of the site. We’ll design both desktop and mobile views, and have included up to 2 rounds of revisions to this initial design. If you choose to work with our studio to do a full design and build of your website, we will start the process by completing a full site design based on the decisions we made with the home page. During this phase, we’ll be able to stretch our imagination and customize each element of the website (depending on your platform) to perfectly translate your brand’s unique style. You’ll see each page in desktop and mobile view. We’ve included up to 2 rounds of revisions to the full-site design. Our intention is to finalize all design details during this phase so that we have final approval on the site before moving into development. It’s much easier to make design adjustments, and try different styles, during the prototyping phase instead of making big changes during development that could change the entire site. Once the design has been finalized and approved, we’ll go into development, when you can sit back and let us build your site. We build things to last, so you can expect that we’ll troubleshoot and test your site on multiple tablets and browsers to make sure it’s always presented in the best light. And finally, you’ll be ready to launch your new site! We’ll include a PDF Launch Roadmap to help guide you as you begin using your new site. We’ll give you options for maintaining the site, tips for promoting it on social media, and social media graphics to share your new website design with your online audience! Want a brand to go with that new website?